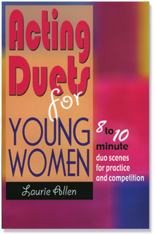 This collection of 24 original duet scenes are based on the real-life situations faced by young women today. Split evenly between comedic and dramatic scenes, the 8 to 10-minute length of each royalty-free scene is ideal for forensic competition or acting practice. Laurie Allen grew up in a small West Texas town where her high school often won the coveted State UIL One-Act competition. An award-winning playwright, she knows what it takes to create winning scenes with interesting situations and colorful characters. Titles include “And the Winner Is...”, “Dirty Laundry,” “Broken Promises,” “Reflection,” and many more! This wonderfully diversified collection of monologs, dialogs, trios and quartets deals with subjects of self-discovery, survival in the real world and daunting decisions from tragic to trivial. These books will put fresh and fun, easy and age-appropriate skits at your fingertips!